Let's Build a Guitar! #2: Hmmm, Trouble figuring out Dyes and Finishes. Alright ladies, and the rest of you less refined members of humanity. I bought some J.E. 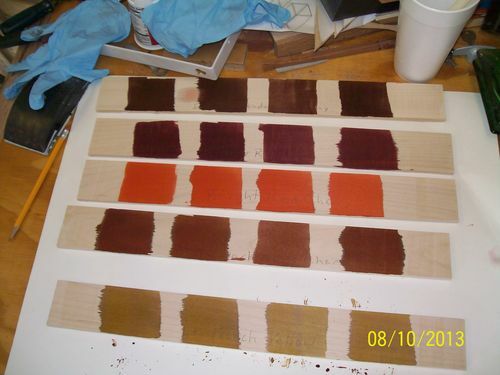 Moser water soluble wood dyes, except there is a problem…. The website for them says they make 1/2 gallon, with water, per ounce of powder. The bottle says each bottle makes 1 gallon per ounce..
How do I deal with this? I have a dozen spankin’ new, unused, pint Mason Jars that my wife bought for me, probably so I wouldn’t use the good ones. I have no idea how much tint dye I need to do a single guitar. I’m not sure even of the color I want, although a dark brown mahogany using the flame maple veneer top sounds really cool. Anyway, I need some direction on where to go with this. I’ll post color numbers and sample swatches later, after after I get some of these mixing, blending and volume problems taken care of. These are pictures of the five colors of dye I have. I am testing different colors and will add another color in subsequent tests. If you have a small digital scale or balance, measuring in grams or ounces, and if you contact the company and inquire as to the correct recommended weights/gallon ( as there is a direct error in the two pieces of information in directions); (divide by 8 to get quantity/pint) then you can mix all kinds of different portions in various jars and test samples of wood and veneer until your hearts content. Guaranteed I wouldn’t want to mix it all at once…. therein lies the conundrum! (Big words, I was watching a highbrow TV show). I really want to mix about a cup of each or less. I’m thinking about measuring the bottle, dividing by 16 to get the cup value. I suppose Monday I will call JE Moser and see why there is so much difference. I don’t mind making the mixture too weak, then it’s just a matter of adding more coats of dye to get where I want to be. Making it too dark would be a bugger as the flame maple is just a veneer on the face of the guitar and I can’t sand it too aggressively. My test wood will be some maple I have but it isn’t flame maple, It does have some curl to it If I re-saw it as quartersawn, otherwise it’s pretty plain. When I first started with dies, I followed the directions per letter. Now, I mix the way I want. I usually put a small amount in the water, mix and test. If I want darker, I add a little and test again. I even do that if I mix colors. It just takes experience and playing around. Kinda like working wood with a planer or a plane. Play around until you find what you like. The only problem is cost. That’s no big step for a woodworker…right? Experiment with ratio’s using kitchen utensils such as, one 1/8th tea spoon of dye per 1/4 cup water, then keep adding 1/4 cups of water or less to see what you think of the colors you get. Make sure you right down the ratios or put them on labels on each jar. Thanks guys. That may have to be the route I take. To tell the truth, I have no problem running experiments on something I have thought up from scratch, but for some reason I am scared to death of the dyes and the flame maple top. Maybe I’m seeing to many problems that could arise. On a re-reading of your fourm input, maybe there’s the difference in their instructions. One measure is for dry weight ounce for powder; the other for liquid measure ounce each per gallon. But, in any case, as all others have said, just use a SMALL amt with SMALL amt of water and satisfy yourself with the results keep tract of the ratios for future use. Then work your wonderfully crafted instrument. I mixed up one cup of each color adding one rounded teaspoon per cup of water. The strength seems to be about right. I made some swatches (pictured up above) and and adding colors together to see what comes up. 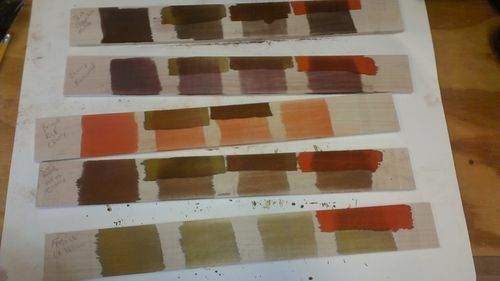 Some of your samples look pretty intense ,not sure if you have used dye before but if you haven’t ,dye keeps getting darker and darker with each application so you can start with a very thinned down version of dye and sneak up on the color you want . Because dye gets darker with each application you have to be careful about getting overlap marks so it’s best to spray in wet coats and wipe off the excess for each coat. Wow! Thanks Jim…. Thats what I needed to know. I have not used dyes before, that’s why I’m going this now. All information is appreciated. Maybe I will cut these samples with another cup of water to thin them out. I’m not sure since it’s been forever since I mixed and dye, but you may have to strain your dye in a paint filter to get out any lumps. If you see lumps in your samples you probable need to strain it. I don’t think it needs to be strained, probably because you make it with almost boiling water. I let it sit overnight before use and didn’t see anything on the bottom of the jars. 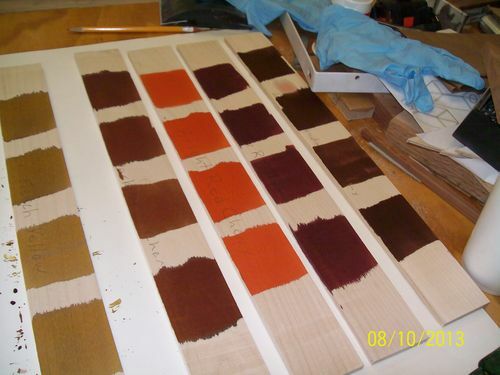 Up until watching Woodsmith Shop on PBS a couple of years ago I had never thought about stains, dyes or tints. Now that I am trying to up my skills a bit, I am trying to learn more about them. All the tutorials I see on line seem to take for granted that I have some experience with dyes and don’t go into a lot of details. Has been my mentor on finishing and I’ve learned a lot from him. He has a subscription on line finishing class that includes a library of videos on finishing and a forum to ask any questions you have about finishing or help fixing a problem that he get’s back to you in a timely manner. I hope you guitar’s finish turns out great. I will check him out. This may be one area where I need professional help…..... no comments from the peanut gallery please! In the meantime here is a shop picture of a test I did on the piece by adding a stripe of another color after sanding off at 240 grit. tomorrow when it has dried completely I will sand it off and see how it looks.